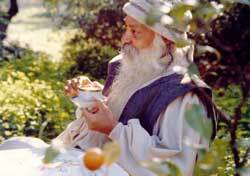 Both Ahuti and Svargo have been disciples of Osho for many years. Acupuncture is utterly Eastern. So when you approach any Eastern science with the Western mind, you miss many things. Your whole approach is different; it is methodical, it is logical, analytical. And the Eastern sciences are not really sciences, but arts. The whole thing depends on whether you can shift your energies from the intellect to the intuitive, whether you can shift from male to female, from Yang to Yin. Can you become passive/receptive? Only then do these things work. Otherwise you can learn all about acupuncture and it will not be acupuncture at all. You will know all about it, but not it. And sometimes it happens that a person may not know much about it and knows it; but then it is a knack - just an insight in to it. When you touch anyone’s body, or you work with needles, you are working on God. One has to be very respectful, very hesitant. One has to work not out of knowledge, but out of Love. Knowledge is never adequate; it is not enough. So feel for the person. And always feel inadequate, because knowledge is limited and the other person is an entire world, almost infinite . . .